All Locatrans is a Multilingual Translation, Localization, Desktop Publishing and other related linguistic service provider committed to providing our clients with services of the highest quality. Our goal is to provide client satisfaction through professionalism, competency, efficiency, and courtesy. We are unique in that we provide our Multilingual Services as a company that truly understands the field of our business. 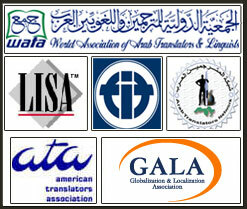 All Locatrans Team Members have expertise in the Translation, Localization and Desktop Publishing fields. Beyond knowledge and experience, All Locatrans is a value driven Company. Our team members are individuals who truly care for and have made a personal commitment to the clients we serve. "To become one of the best Multilingual service providers for the World's Largest and Most Engaged Community"
At All Locatrans, reliability and trust make us your best Multilingual Service Provider. Feel free to Contact Us for any of the above listed services, and we assure perfect quality output for the most competitive rates in the global market place.